Insulin Syringes There are 4 products. We sell Caninsulin Syringes as well as BD Microfine Syringes to administer canine insulin to dogs with Diabetes. Diabetes mellitus is a disease in which the beta cells of the pancreas either stop producing insulin or can no longer produce insulin in enough quantity for your dog's needs. Diabetes is commonly divided into two types, depending on the origin of the condition: Type 1 diabetes is caused by destruction of the beta cells of the pancreas and is the type that affects Dog. The condition is also referred to as Insulin-Dependent diabetes, meaning exogenous insulin injections must replace the insulin the pancreas is no longer capable of producing for the body's needs. Diabetes affects 1 in 500 dogs. BD Microfine Insulin syringes with needles. Not usually for use with Caninsulin insulin. 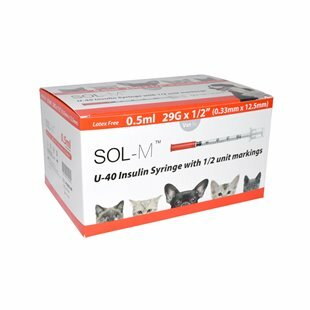 Box of 100 x 1ml Insulin Syringes.